Lieutenant Governor Karyn Polito’s home in Shrewsbury. 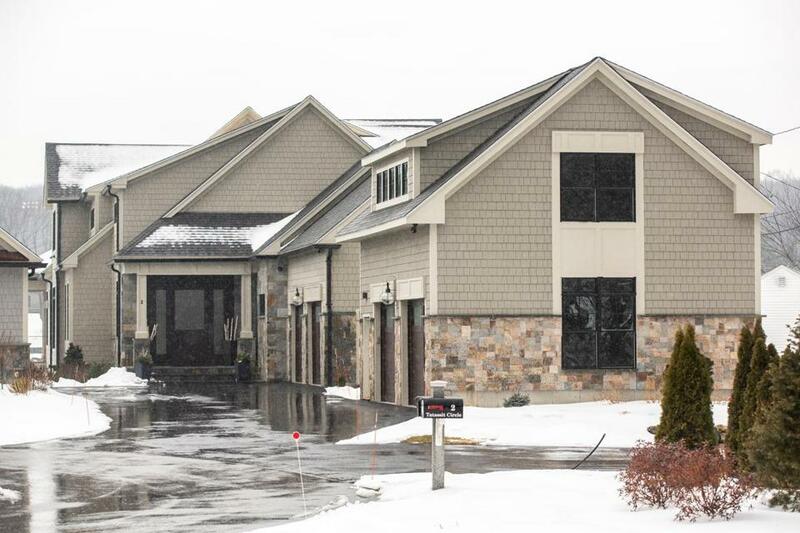 SHREWSBURY — Before settling into their new lakeside home in 2016, Lieutenant Governor Karyn E. Polito’s husband had a request that one town official said he’d never gotten before: that details of their $1.5 million house be scrubbed from an online public database. Christopher Reidy, Shrewsbury’s principal assessor, said he consulted with then-town manager Daniel Morgado, who knew Polito because she was among the board members who selected him for the job two decades earlier. And “probably within a day,” Reidy said, he removed the information from the town website, a first in his 10 years with the department. Although legally allowed, the exclusion of Polito’s home from easily accessible records is unheard of among the state’s other highest-ranking elected officials. It’s also an anomaly in Polito’s lifelong hometown of Shrewsbury, where she served as a selectwoman and state representative and where her family runs — and she owns a piece of — a real estate development company. Polito on Wednesday noted, correctly, that the records are publicly available at Shrewsbury’s town offices, where the Globe obtained a two-page document showing that the 5,969-square-foot, Colonial-style home along Lake Quinsigamond was recently assessed at $1.49 million. She said she has also disclosed her home address in other public documents, including campaign finance filings, and lists her home among assets on a state-required financial statement. 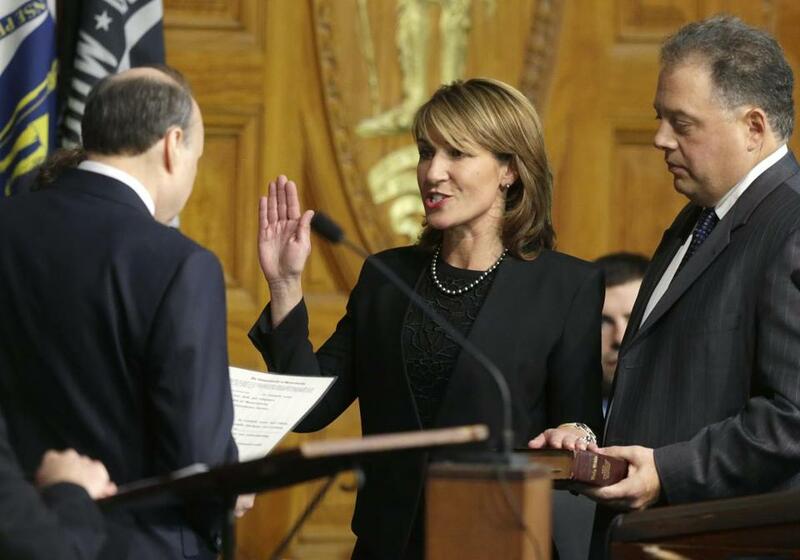 Karyn Polito with her husband, Stephan Rodolakis (right), when she was sworn in as lieutenant governor in 2015. “I don’t know exactly why whatever you’re looking for isn’t available online but all of the records are available at the municipality,” she told the Globe in a brief interview at the State House. Lizzy Guyton, a Polito spokeswoman, later said that Polito’s husband, Steve Rodolakis, had requested that only certain information not be posted online. Polito, according to her office, didn’t speak to any local officials about it. Reidy said there was no written request, and that Polito’s position as the second-highest-ranking official in state government did not have a bearing on his decision. “Steve Rodolakis requested that the detailed floor plan and photos not be included in the online database for privacy because children live in the home and because of the lieutenant governor’s public profile,” Guyton said. After the Globe’s inquiries, Rodolakis on Wednesday “requested that the assessor post all required information about the home online,” Guyton said. As of Friday evening, the property’s details weren’t included in the town database. Suppression requests can be common elsewhere in Massachusetts, typically from emergency personnel or political “dignitaries,” according to William B. Mitchell, president of the Massachusetts Association of Assessing Officers. Mitchell, who is also Leominster’s chief assessor, said there are 51 properties suppressed from his city’s database, but he requires requests in writing, so there’s a record. But such information for other public officials is readily available in other town or city online databases. Governor Charlie Baker’s Colonial-style home in Swampscott is assessed in that town’s database at $1.1 million. Senate President Karen E. Spilka’s $785,000 Ashland home is also listed online, as is the $431,300 Cape-style house that House Speaker Robert A. DeLeo owns in Winthrop. Details of the private home of each of the state’s four other constitutional officers — Attorney General Maura Healey, Secretary of State William Galvin, Treasurer Deborah Goldberg, and Auditor Suzanne Bump — also are publicly available on their local sites. Assessor records show Reidy inspected the Polito home in August 2016. It was then, he said, that he was asked that its details be withheld from the database. He said he later discussed it with Morgado, who had been town manager since 1997, when Polito served on the Board of Selectmen. Morgado, who retired as town manager in 2017, said that he did not recall any discussion with Reidy about Polito or her home. Morgado said he couldn’t address whether removing the information from the site was appropriate. “I’d have to think about it and take a look at what’s online,” he said. 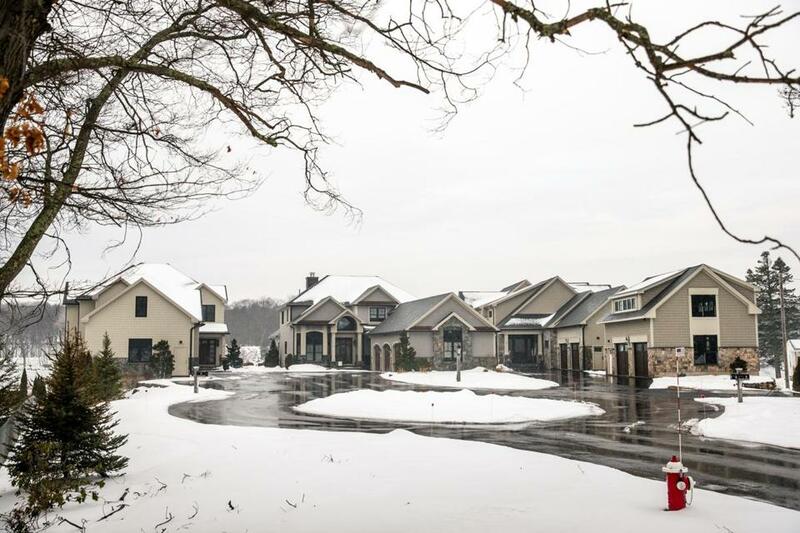 The lakeside properties owned by members of the Polito family in Shrewsbury. Polito and members of her family used a trust called South Shore Realty to buy the lakeside property in 2012, with access to a small nearby island, for $360,000, records show. Her brother and parents have since built their own homes on the Tatassit Circle site, each of which are included in the online database, as is the island itself, which features a small footbridge and an outbuilding and is alone valued at $334,700. Polito, who had lived elsewhere in Shrewsbury, moved into the home in 2016, when public records show it was last assessed at $985,100.